Mid-Autumn Festival a.k.a Moon cake or Lantern Festival which falls on the 15th of the eighth month in the lunar calendar, is barely a month away. It is celebrated by the Chinese and Vietnamese people, and it is believed that the moon on that night is the roundest. There are many legendary stories behind this festival, and the most well-known one is relating to the Moon Goddess of Immortality (常兒）who has swallowed the elixir and flew into the sky, and known to reside in the moon accompanying by a Jade rabbit. Hence, on this day, people would worship the moon. Apparently, there are also several versions to the same story. This is known to be an occasion for outdoor reunion among friends and relatives savouring the moon cake with brewed chinese tea whilst admiring the moon. And the children would carry the lit lantern. Traditionally, this is also a day for courtship and match-making for the singles. Beside mooncakes, chinese tea, Mid-Autumn Festival has also reminded me of pomelo which is one of the food offerings made to the deities. Looking at the big green fruit with a nice fragrance on its skin, immediately I thought of making the Mango Pomelo Sago Dessert (杨枝甘露). This is my all-time favourite cold dessert. 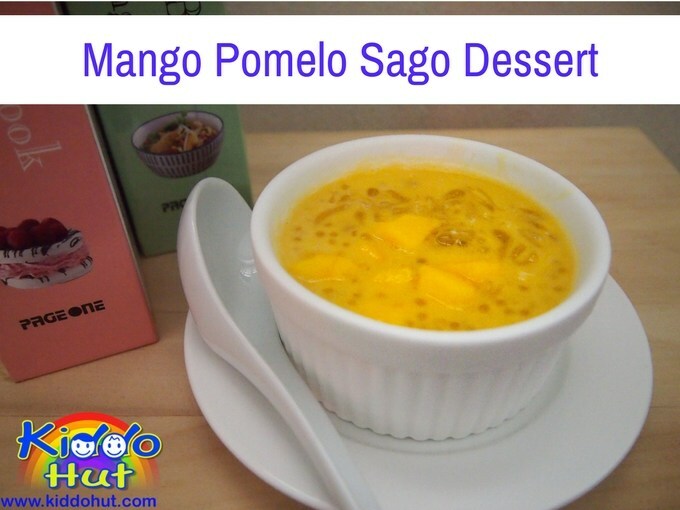 Apart from the Sago, there is no cooking required in this recipe! I simply love the KISS (Keep-It-Short-&-Simple)! 1. 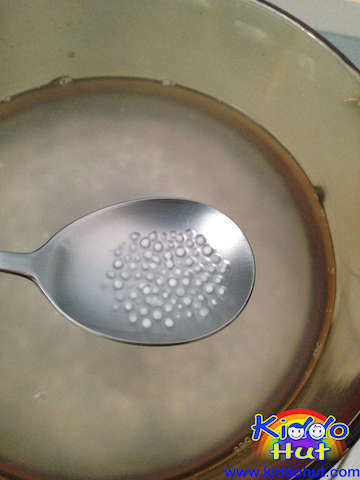 Cook the sago for 15 minutes until the sago turns translucent at the side and left a white dot in the middle of the sago. 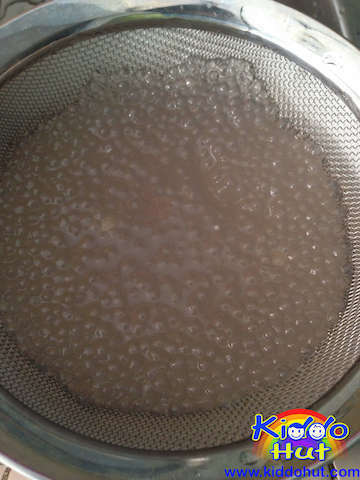 Do stir while cooking to avoid the sago sticking to the side and bottom of the pot. 2. 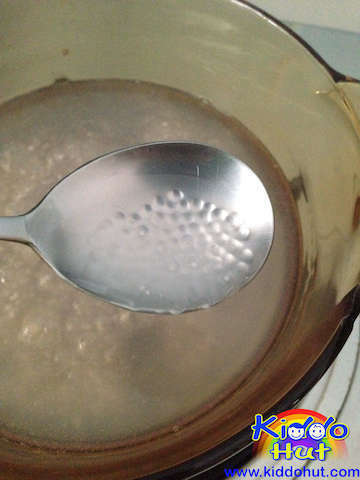 Turn off the fire and let the sago rest in the pot for another 5-10 minutes until it turns transparent like. Do stir occasionally. 3. 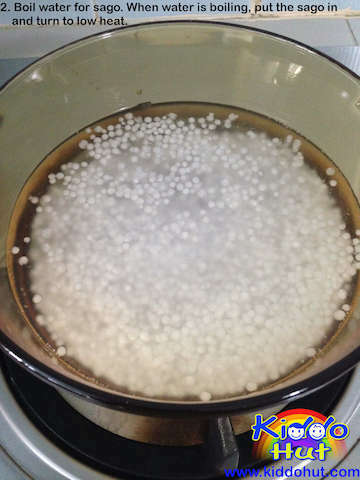 Drain the cooked sago through a fine holes sieve and run through running water to remove excess starch, and set aside. 1. Dissolve the sugar using just enough hot water to make sugar syrup. 2. Cubed the mangos and peeled the pomelo, separates the pomelo sacs. 3. 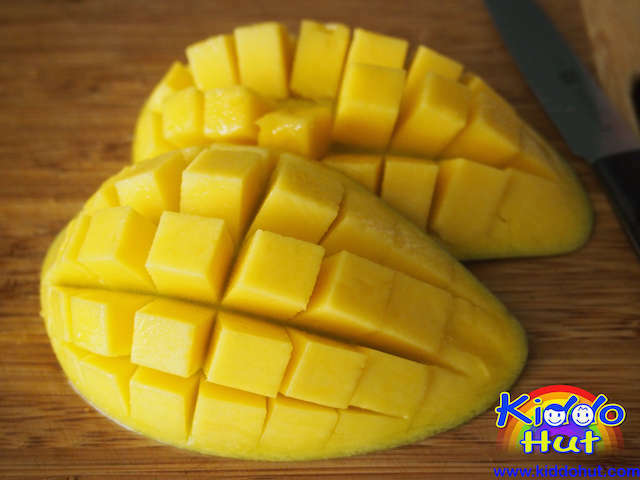 Put 3/4 of the cubed mangos and evaporated milk into the blender and blend for 30seconds to a minute until well mixed. 4. 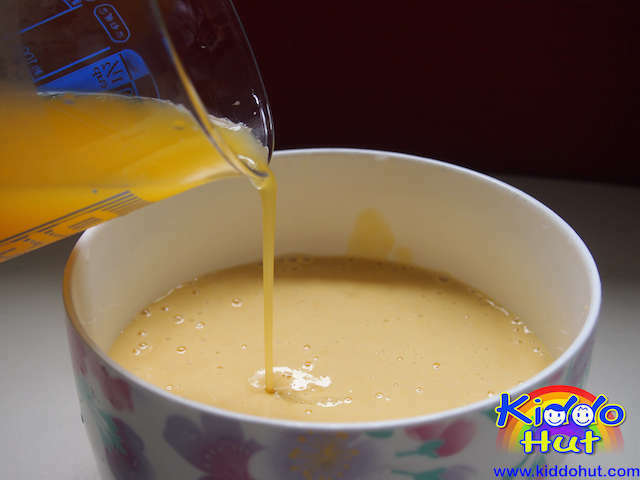 Mix the mango smoothie with mango juice. Followed by the sugar syrup to taste. 5. 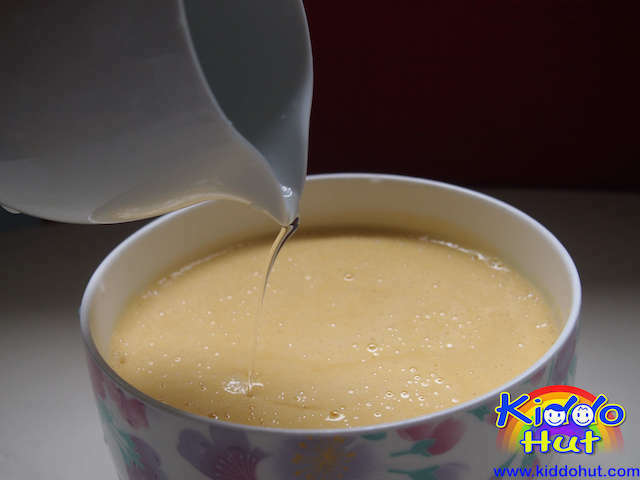 Add the cooked sago and chill in fridge. 6. 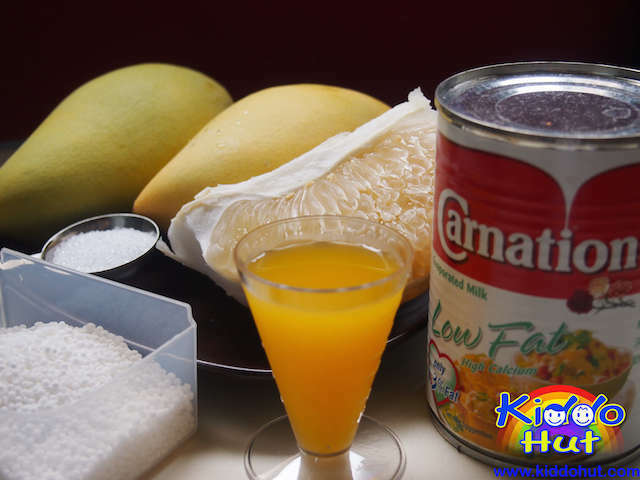 To serve, add some pomelo sacs and cubed mangos. 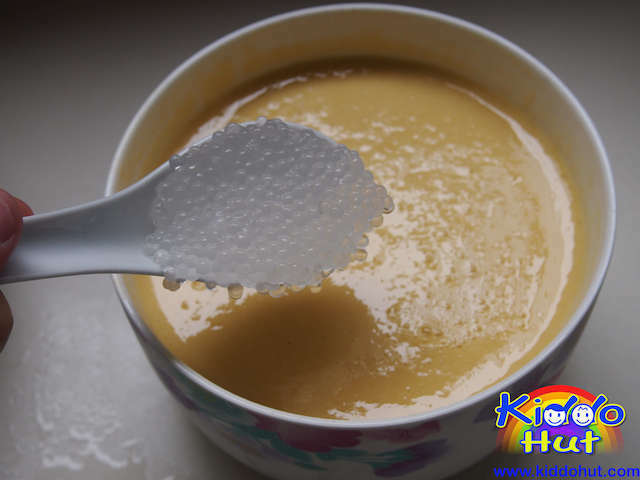 If you like a more sticky or thicker texture, you may dissolve 1 tablespoon of cornflour or tapioca starch in 1 tablespoon of water, then pour into the sugar syrup and stir over low heat until the mixture is smooth. I prefer not too thick texture and minimise cooking.